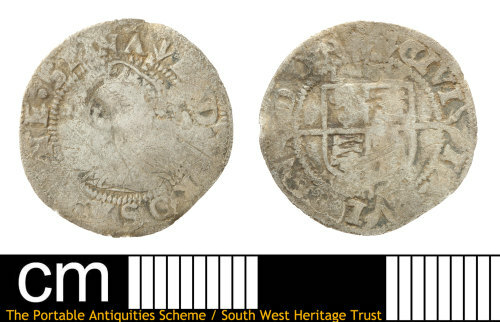 Post-medieval silver three halfpence of Elizabeth I (AD 1558-1603) dated AD 1561 on coin. Initial mark pheon, minted at London. North, (1991, p.135), no.2000. Obverse description: Crowned bust facing left, rose behind the head. A post-Medieval silver three-halfpence of Elizabeth I (1558-1603). Initial mark: pheon, dated 1562 on coin (North 1991: 135, ref: 2000).